Edited by: Wendy Arons (Assoc. Professor of Dramaturgy, CMU), Theresa J. May (Asst. Professor of Theatre Arts, U. Oregon). The Performance and Ecology project, directed by STUDIO fellows Wendy Arons and Theresa J. May, focuses on the power of performance and theater to raise awareness about ecological issues, stimulate activism, build coalitions, and generally move and inspire spectators to action. 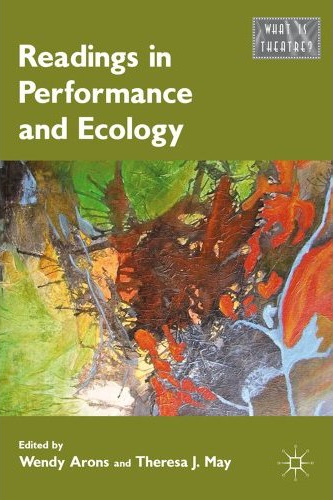 The work requires forging interdisciplinary connections between the fields of environmental science and studies and performance. Project activities include: panels and talks on the practice and history of environmental theatre; staged readings and performances of award winning plays from the Eco-drama festivals, as well as other works; development of courses on the history of environmental theater; and the publication of an edited collection of essays on performance and ecology. The table of contents and introduction to this book can be viewed here, the full book can be found here.